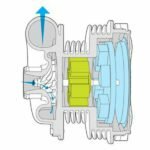 The much maligned electric supercharger, also known as an e-charger (which is also a company developing a compressed air supercharging system), e-supercharger, electric charger, electric turbocharger, e-turbocharger, e-turbo, or booster. Like many automotive technologies has been around longer than most think. It’s not a new thing as evidenced by a cursory online search that shows a patent filed in 1920 for a turbosupercharger driven by exhaust and/or an electric motor. On the Net whenever you find information about an electric supercharger that allows for public comment you will find multiple opinions about how they are a scam and that none of them work. In contrast there are the comments and articles that state they only work is if it’s a centrifugal turbo with an electric motor mounted on the cold side and driven by a 48V power supply. A real world example of a working unit is on Audi’s SQ7 SUV. The first production vehicle utilizing an electric centrifugal supercharger the SQ7 is a twin sequential turbocharged diesel with an electric supercharger. This electric blower provides power in the low revs (1000 to 3250 rpm) as a way to provide boost while waiting for the first turbo to kick in. This supercharger does utilize a 48V system. Outside of that there are many “electric superchargers” on the market. From some interesting ones including 24 volt systems to the “eBay special” which is a fan that is placed within the air intake and powered off the standard 12 volt system. The eBay special is where much of negativity and disdain for e-superchargers comes from as many of these units decrease air flow or just create a drain on the electrical system. To state that only a modified turbo (centrifugal) running on a 48 volt system is the only feasible electric compressor feels a bit naive. As stated there are some 24V systems that look interesting and from that previously mentioned patent search someone had an idea for an electric driven axial flow supercharger. As a turbo is a supercharger running off exhaust gases we’ll just classify any “turbo” or supercharger that is engine and/or electric driven as a supercharger. Turbo’s that are still powered by exhaust gases but with an electric motor will be considered “electric turbochargers”. There is some speculation that E-superchargers just may be the future of supercharging so they won’t be going away anytime soon. If you do decide to go electric then we’d suggested you take the “buyer beware” mindset little extra beware type before pulling out the credit card. As it stands an electric supercharger, as classified on this site, is not really a “type” but how a type of supercharger is driven. For example a type would be “Centrifugal” how it’s driven would be “Belt”, “Exhaust” or “Electric Motor”. We’ve added it here due in part to how it’s being perceived/marketed in public and the general ease of adding it to the site. Drawing of an electric centrifugal supercharger.